Dusty Gold Mini Sequin Skirt - Stretchy, beautiful mini skirt (S, M, L, XL) Made in LA! runs small, ships asap! - FULL front & back sequins. Awesome in person. Length approx 16 inches. Stretchy waist. 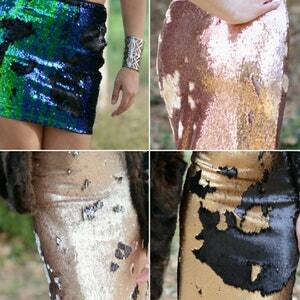 Flip Sequin Mini Skirts - 4 color options! Stretchy, beautiful (S,M,L,XL) Ships asap! Only a few left! Bright Gold Sequin Skirt - Stretchy, beautiful, fun mini skirt (Only a few left!). Ships asap! Gunmetal Sequin Skirt - Stretchy, Beautiful Dark Silver Mini. Ships asap!